St Andrews is the oldest university in Scotland and the third oldest in the United Kingdom. It was founded in 1411 and recognised by Papal Bull in 1413. It has about 7500 students. The City of St Andrews has a population of about 18,000. A good deal of the city’s ancient centre is occupied by University buildings. Its character is also moulded by its celebrated golf course, its beaches and harbour, and the ruins of religious buildings dating back to the city’s mediaeval eminence as the shrine of Scotland’s patron saint, Saint Andrew. The city stands on the east coast of Scotland about 50 miles north of Edinburgh. The local railway station is Leuchars, 5 miles from the town centre and connected to it by a regular bus service. 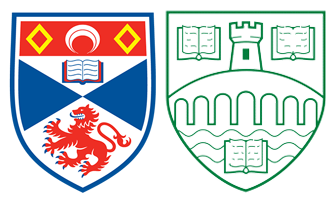 The Philosophy Department at St Andrews is also home to two research centres: The Centre for Ethics, Philosophy and Public Affairs (CEPPA), and The AHRC Research Centre for the Philosophy of Logic, Language, Mathematics and Mind (Arché). The Philosophy Graduate Study Centre is housed in a separate building in Edgecliffe’s grounds, facing the sea and immediately adjacent to the main building. It has a common room, study rooms and computer facilities. Edgecliffe itself has computing facilities, as well as its own philosophy library, which has over three and a half thousand volumes and carries sixteen current philosophy periodicals. Further information about philosophy at St Andrews is available on the St Andrews Philosophy website. Stirling University, founded in 1967, occupies one of the most attractive campuses in the United Kingdom. The campus, which is situated to the north of the historical town of Stirling, has 60 acres of woodland, 300 acres of mature landscaped parkland, a small castle, and a loch with an abundance of wildlife. The campus houses the MacRobert Arts Centre, which throughout the year has a full programme of films, drama, music and dance. Since its foundation the University has grown from small beginnings and now has about 9000 full-time and part-time students. The town of Stirling (population approximately 40,000) is a manufacturing, administrative, shopping and tourist centre in central Scotland to the west of the Ochil Hills and to the east of the Trossachs. The town is connected to the University campus by regular bus services. There are excellent road and rail links to Edinburgh (38 miles) and Glasgow (28 miles). The Department of Philosophy has been a part of the University since its foundation. Its undergraduate degree programmes have from the beginning been structured by a two-semester teaching session. They also reflect the Scottish academic tradition in that they allow for breadth and flexibility of study in the early stages. Further information about philosophy at Stirling is available on the Stirling Philosophy website.